A couple of weeks back, Dreamhost reported a security breach on it’s servers, so I thought for security sake I should change my passwords as well. I’d been using the same password for the past couple of years and it was time for a change anyway. However, as most of you will notice, whenever you’ve just changed your password you instinctively try to re-enter the old one on your next login. This obviously prompts and invalid password prompt which should point you in the right direction. If you’re like me though, you end up thinking you typed it wrongly and try again, this can go on for a while and if you’re not careful you could lock yourself out of your account because you entered the ‘old’ password 3 times in a row. A good piece of design I noticed from Google is that if you’ve changed your password recently, they actually remind you that you changed it and when you changed it. Thereby stoping your automatic response in it’s track and getting you to type the new one. Just a small piece of code and small feature but a rather good piece of design. To me the only way Google managed to figure this out, is they sat down tested out their application, and then when they encountered the issue they didn’t just pass this off as a ‘security feature’ but thought about how they could improve the user experience. Something a lot of other designers don’t do. 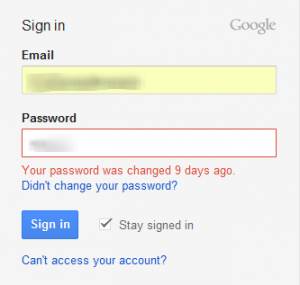 Or maybe Google just copied it from somewhere…either way this feature should be on every login page on the internet.